When sliders vie with sushi, you know you're in for more than surf and turf. They've become the totems at countless East-meets-West restaurants. Kenta is the newest entry in this very of-the-moment competition. And it's among the best. It succeeds the hard-edged and erratic Nisen 110 at this angular site just off the busy business corridor of Route 110. 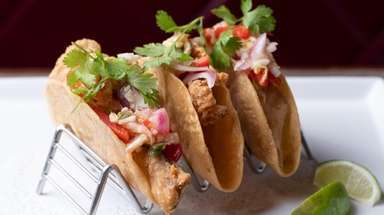 The interiors of the sleek, modern spot have softened a bit, and the service has improved dramatically. 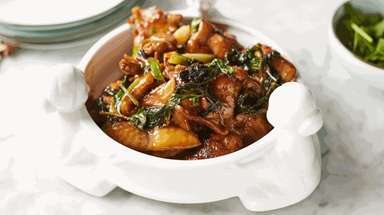 More important, executive chef Jason Lee's fare is very good, often better. That begins with the day's special sashimi or sushi. That could be a perfect sashimi of whole horse mackerel, artfully arranged and backlit, looking as if it were sliced while arcing from the sea. The flavor is fresh, marine, terrific. You'll say the same about the lustrous sashimi of Kona kampachi, or baby yellowtail from Hawaii. Each could be the lead swimmer in a chef's choice dinner. Traditional sushi also is excellent, especially toro, or fatty tuna. The kitchen sends out more than a dozen "special rolls" of sushi. Several are good, but the ingredients don't always harmonize. 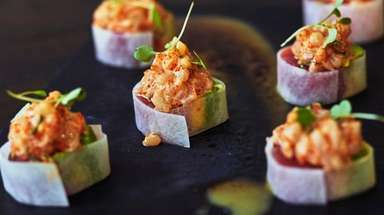 "Looney tuna" offers spicy tuna, avocado, roe and some "crunch" outside, and black pepper tuna, white tuna, scallion and caviar inside for an unwieldy alliance. "Lobster lover" takes in spicy lobster and asparagus tempura outside, steamed lobster, mango, flying fish roe and balsamic vinegar inside. Two pieces of flawless toro come in at the same price or lower. Kenta's appetizers include the unexpected and unconventional avocado toast with burrata. The toast is layered with a cousin of guacamole, a spread of the creamy cheese, and a drizzle of basil oil, with a trace of roasted chile, too. It works. So do the Kobe beef sliders, finished with a marinade similar to what you'd get with Korean kalbi, and garlic aioli. The Kobe meatballs are less inviting, thanks to a too-sweet glaze and wasabi aioli. Fried oysters arrive crisp and slightly briny, finished with parsley and lemon sauce. 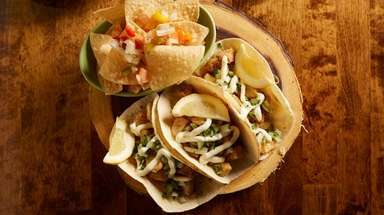 The ceviche-style lobster taco trails it. 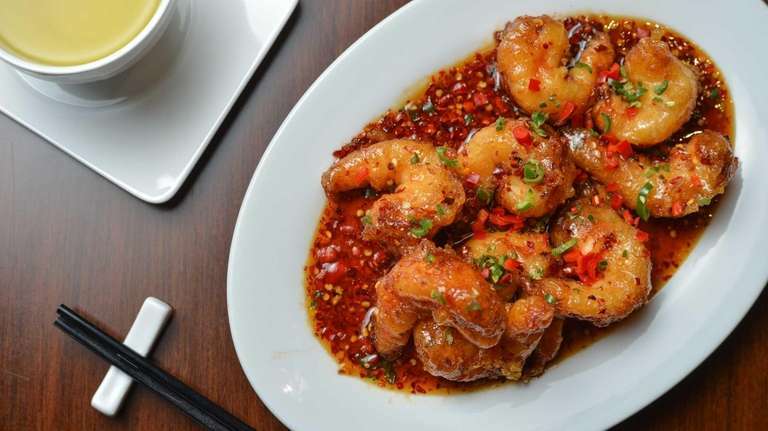 Sweet and spicy jumbo prawns are deftly sauced and earn both adjectives. 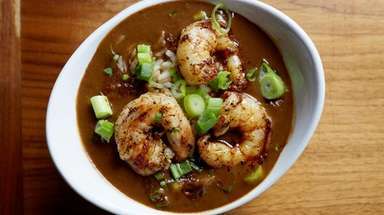 You'll be adding the sauce to a bowl of white rice. Organic chicken with shallot sauce, wasabi-sparked mashed potatoes, and just enough crisp garlic also tops the main courses from the kitchen. The tender, sliced filet mignon, however, isn't boosted by a dull peppercorn sauce. On the side, consider the sauteed fennel and wild mushrooms, or the garlic-truffle fries. Desserts are unnecessary, unless you're lured by the prospect of a tempura-battered Oreo. Sometimes, East and West should just keep to themselves. Since 1985, Peter M. Gianotti has been the restaurant critic at Newsday, where he also reviews books.